A person’s dressing style plays an important role to enhance their disposition. Your wearing style conveys your personality, characteristic as well as how fashion oriented you are. Not only matching or contrast accessories are important to wear with clothes but also to follow the latest fashion trends. Furthermore, it’s necessary to find out fabrics and pattern that suits on your body according to body type, complexion, clothes, climate, and occasion. Dressing sense shows your reflection of your mood and who you are in person so be careful while choosing any fabrics for your style. The Indian apparel trade is growing day by day gradually worldwide. E-commerce platform and social media such as Instagram, Facebook, and Pinterest play a vital role to provide you with more ethnic wear’s collections based on current trend and its selection. Before you purchase from the online or offline shop, have a look through below material details that will be in demand this year. Silk is a smooth and shiny fabric that is mostly purchased by rich people due to its regal appeal. India is not only the largest producer of silk but also a huge consumer. From ancient times to modern days, silk is still popular not only in fashion industries but also home décor or furnishing industry. It is acquired from several species of moths and passes through a number of processes and as a result, silk material is gained quite expensive. There are varieties of silk such as Dupion Silk, Organza Silk, Tussar Silk, Banarasi Silk, Art Silk, Cotton Silk, Silk Linen, Fuji Silk, Silk Satin, Patola Silk, Raw Silk, Mysore Silk, Chanderi Silk, Dharmavaram Silk, Paithani Silk, Banglori Silk, Muga Silk, etc. but Patola Silk is in fashion. You can opt it according to your requirement. The actual use of silk fabric is infinite. It can be utilized for regular wear but mostly suitable for special occasions like wedding, engagement, parties or religious events. Silk is a luxurious fabric which helps to keep shape well, remains soft holds and provide ease for pleating. Varieties of outfits can create in different styles, cut and pattern. SareeO supply unique silk collections of the textile hub – Surat that assist to deliver ultra-modern attires across the globe. Among all silk collections, sarees are excel to possess. Velvet was introduced in 809 A.D. but still, it is not out of fashion. The word ‘velvet’ means the fabric which is soft, smooth and rich appearance. 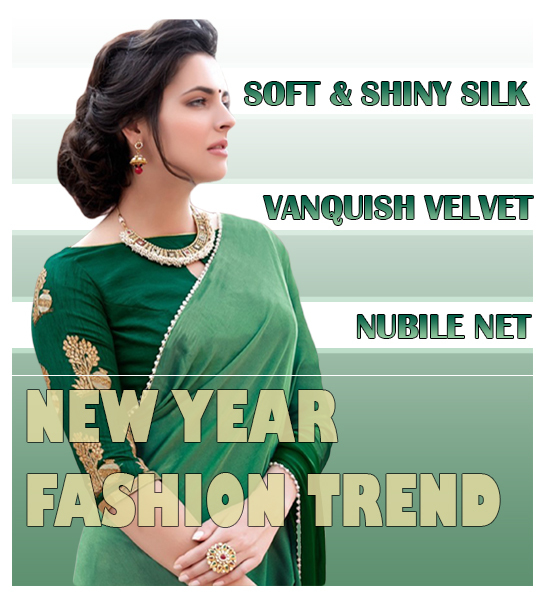 The popularity of velvet increase day by day and recently, it comes back in trend. Silk is combined with cotton and wool to create velvet. Previously, it was a handmade product so it was quite expensive and only became the choice of the royal family but nowadays, anybody can wear as it is available at a cheaper rate due to power loom development. Different variants of velvet are available but these are well-known variety: Devore Velvet, Velveteen, Plain Velvet, Crushed Velvet, Embossed Velvet, and Hammered Velvet. Fashion designers implement the velvet in blouses, top of the suit, lehenga, kurtas, sometimes in traditional mojris or jootis. Appearance mainly depends on how effectively material is used and the process is involved. Clothes even accessories made from velvet gives a royal and elegant look that’s why it becomes a choice for a wedding, festivals or religious events. The only main concern is to take care of this fabric well that you can manage by doing dry cleaning and hang it on the padded or soft hanger. The bride looks extraordinary in velvet collection. Attire with the net is one of most sheer fabrics and that is adopted by Indian as well as Western cultures too. Since former days, the net is used in many ethnic outfits. The western community uses it in their wedding gown. This fabric is found since Victorian Era & introduced to Indian culture during the British Empire and it is being used widely by Indian people to create a unique pattern. It is obtained by fusing at several interactions inside the loops. There is numerous variety of net fabric used in the fashion industry like Filet Net, Fishnet, Tulle and Bobbinet. It can be used in lehenga to create an outer layer, make a part of saree and dupatta of dress. Sometimes, it can be utilized to create one layer over other for high volume. Dressmakers use the net to generate neckline, sleeve, and hemline. 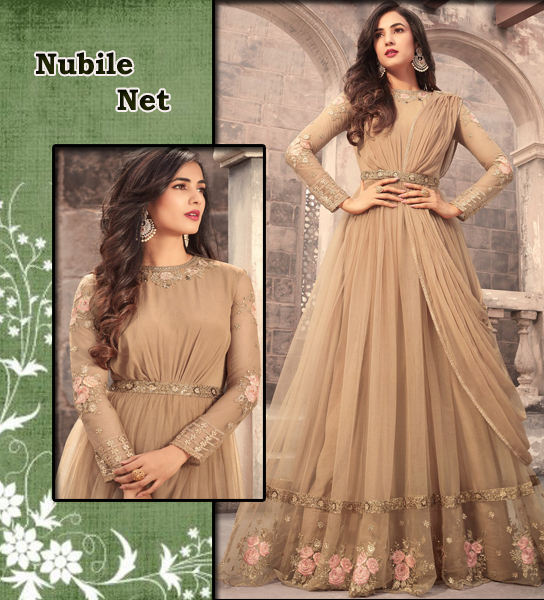 Net collection usually highlights any attire especially gown. Acceptance of net clothes gives a charming appearance at nonformal events. Anarkali suits or gown are acceptable with heavy jewelry as the net is mainly use for making skirts, sleeves or outer layer of suits. Recently, the net is combined with ruffle style which is latest in trend.